On the Saturday before last, a rainy and humid day, we made our way to the Museo Nacional de Bellas Artes to see the collection. 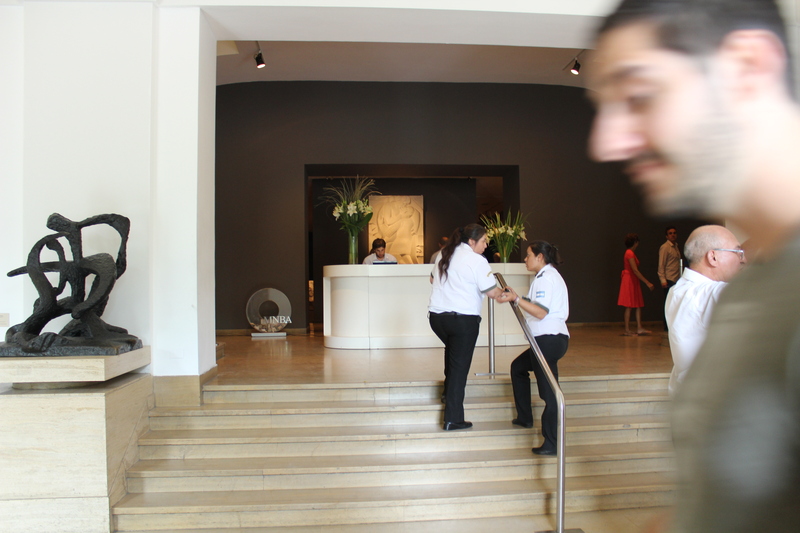 Like all public museums, the Museo Nacional de Bellas Artes is free to enter. The government of Buenos Aires, being somewhat socialist, has a strong belief that cultural events should be accessible to everyone. Museums are free, ballets and operas are very inexpensive. It’s really wonderful to be able to see art, both fine art and performance art, without breaking the bank. In New York, there are some museums that are free or have free days, but anything at Lincoln Center… forget about it. The one pic I was able to snap inside before getting yelled at by the guards. This is the immediate entrance of the museum. After a little searching, we were able to rent some headsets to give us a little background information about the art we were going to see. The paintings are arranged chronologically and as we walked through the museum we were able to see the progression of techniques from one century to the next and how previous artists, along with the political and cultural climate of the time, influenced the styles. It was really interesting to hear explanations from the Argentine perspective. Each room in the museum had a different theme sometimes dedicated solely to one revolutionary (often South American) artist and other times holding the entire donated collection of one individual. We were only able to visit the planta baja ground floor on this trip – the stairs we could find were roped off and the map we had actually only showed the ground floor, so I can’t really say anything about the other 2 floors – but we have big plans of going back to try to find the other rooms. Map of the Ground Floor. Go here to see a list of what each room contains. http://goo.gl/OhHd9 You can also click on each room to get an explanation of the art. It’s in Spanish but if you’re using google Chrome, the browser may offer to automatically translate for you. Of course one of my favorite rooms was the french impressionism showing some of Dégas work. I remember studying his revolutionary sculpture, Little Fourteen-Year-Old Dancer, at the Musée D’Orsay in Paris, so seeing some of his pastels on cardboard was a treat. It’s incredible how he can capture the movement and lighting of the moment just with pastels. 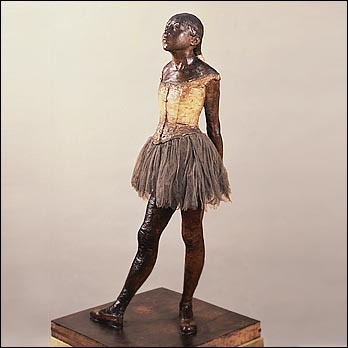 Degas’s Little Dancer was the first time an artist had incorporated real materials into a sculpture. Many of his paintings and sketches focuses on French Ballerinas. Another artist I really liked, that I had never seen before (that I can remember), was Francisco José de Goya y Lucientes. His work is a bit dark with thick, almost harsh, strokes and the subject matter, in this particular room, was dramatic and romantic, focusing on life during the war for independence that was ongoing in Spain at the time. Two other rooms that stuck out both to Jesse and I were the rooms of Argentine art of the 19th century, which primarily featured work of Prilidiano Pueyrredón and his mentor Cándido Lopez. Their wide canvases and use of colors really opens up the scenes and allows you to feel the expansiveness of the countryside. What is amazing is that Lopez lost his right hand in the war and completed many of his paintings, which focused on soldiers life during the war, using sketches he had made and painting with his left hand. The work is really precise and impressive. There was also a temporary exhibit in a large room at the back of the museum that included prints from the early 20th century including those of Toulouse-Lautrec and Picasso. This exhibit was great – very different than other art we had seen throughout the permanent collection. 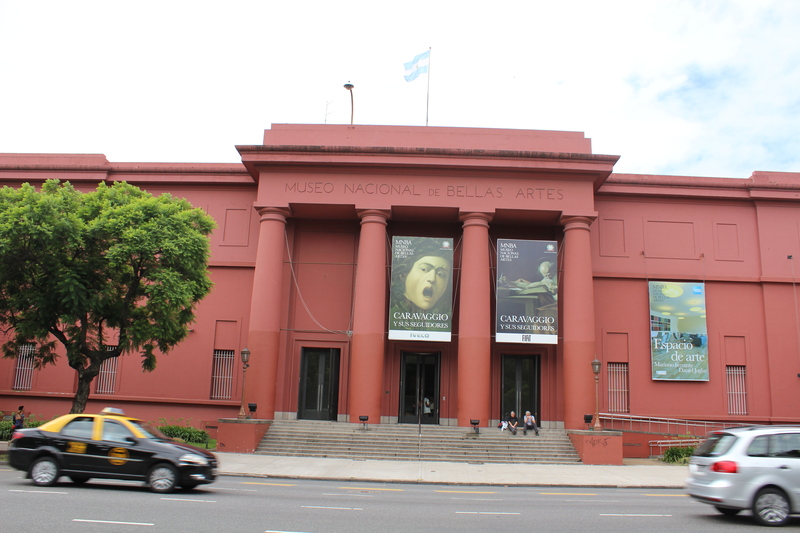 If you’re in Buenos Aires and get the chance to check out the museum, it’s a great stop. I hope we get to go back and see the statue garden! It is truly incredibly what nimble fingers can do with marble and copper. ← Happy MLK and Inauguration day! Looks like a fascinating place. Definitely would love to see it!